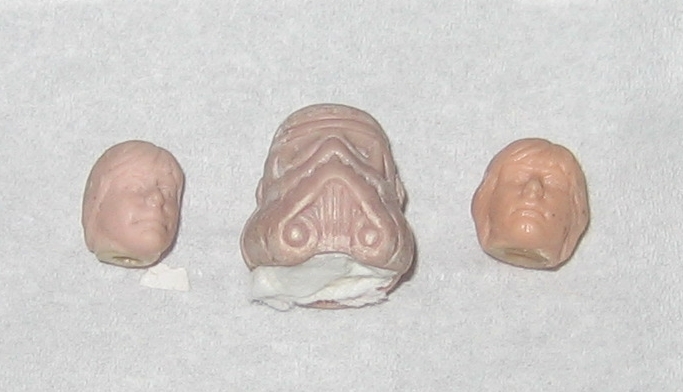 These are wax head sculpts from the vintage Star Wars action figure line. The head on the left is that of Luke Skywalker in Stormtrooper disguise, a head that was specially designed to fit inside the helmet shown next to it in the center of the image. Both the head and helmet were made crafted out of wax, and these wax sculpts were used to generate the molds and hardcopies for the production figure. To the right is the sculpt for the Luke Jedi action figure, also made of wax. Note the size differences between the two Luke heads, which shows how difficult it would have been to use the Luke Jedi head on the Luke Stormtrooper figure with removable helmet.